"At Little Jest Set, you'll find stylish functional and innovative to make traveling with kids easy, fun and educational. Pack smart , travel happy." If you have kids and travel a lot (or even if you don’t), you need to get a Zoobie Pet! What is a Zoobie Pet ? Zoobies are an ultra soft 3 in 1 blanket, pillow, cuddly toy that babies, toddlers, tweens and teens will love. How do I know? We got to review one of them from Little Jet Set. 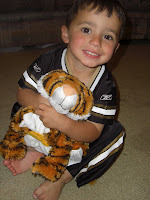 Since our Zoobie Taj the Tiger joined our family I think all my boys (13,10&2) have had their turn with him. Each Zoobie has its own distinctive feel and touch, fun for kids to squeeze. 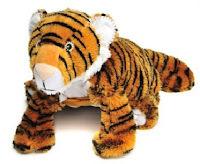 Every Zoobie has a few different tactile textures for children to pet and play with. So much more engaging than just a boring standard soft toy. I was amazed on how big the detachable fleece blanket is, I can even cover up with it with no problem. Even with messy little ones you do not have to worry, just unzip and throw the blanket in the wash and spot clean the body ! Little Jet Set has many different Zoobies including an Elephant, Croc, Baboon and many more ! See how easy our Zoobie Taj transforms ! Before you get ready for that summer vacation or that weekend trip to Grandma's house visit Little Jet Set to keep your little one comfortable and entertained on the way ! They have everything from Books & Flashcards , Games & Puzzles , Luggage & Bags, Pillows & Blankets and much more ! Little Jet Set is offering my readers 20% off your entire purchase at Little Jet Set with coupon code “BLUE20” through 5/31/09 ! Little Jet Set is offering one of my readers a Zoobie Travel Pet ! I love the What's A Dragon Chalk and Doodle! Winner has been emailed ! Winner has 48 hours to claim prize ! I like the Sand-Goh toy. It would be perfect for the beach. I like the Red Hearts Small Backpack. I really like the Princess Dress Up Doll by Mudpuppy. I love all those sets! Those are so much fun! Thank you so much! The Lacing cards would be a great church bag item! I really love the Vehicles Mini Puzzle Packs by Melissa & Doug. Thanks so much. Frieda the Trunki is very cool! I love the xcase mini cobalt blue. :heart: Not entering. Just commenting. Love your video, chica. And Little Jet Set rocks! I also love to have the Towgo the Trunki. I like the Lace and Trace. I have your button on my blog too. I really like the Piggy Mermaids Art and Activity Backpack. I think this would be a perfect gift for a little girl I know. Thanks for the chance to win a Zoobie. Love Little Jet Set! Frieda the Trunki is so cute! You are linked on my blogroll. Girls Terry Cover-Up from Cabana Life is sweet. Thanks. I like the Double Shutter Jr. by Blue Orange Games. It's always fun to get a different kind of game. Love the xcase® Mini - Purple by Heys. I like the Lace and Trace Pets by Melissa & Doug for my son. I also love the xcase® Mini - Purple by Heys on the site, this would be perfect fro traveling with kids! Thanks for the great giveaway! Horses Go Puzzle by Crocodile Creek!!! The Gator Play Blanket by Mud Pie is adorable! Great to take along as a toy and then use the blanket when you need it! I love the Doggie Diary Ramblin' Kid Suitcase Sleep Set by The Piggy Story. Frieda the trunkie suitcase looks like so much fun! I like the Zoolio Rainforest. It should keep my toddler occupied for a while...and that's a blessing! My granddaughter would like the Fun Flower lap desk. A little jet setter will feel so good with the Piggy Mermaids Lil' Diva Valise Sleep Set.This is too cute and my little one would feel so grown up. The Jungle animals first puzzle set is neat! Thanks for the chance. I loved the horse backpack. I like the dress-up pirate by Manhatten Toy. I adore the Cow Print Art and Activity Backpack by The Piggy Story. I really like the Magnetic Animal Habitats by Melissa & Doug. I like the Sketch + Draw + Color Bugs by Mudpuppy. Little Jet Set also has Activity Backpacks that look very cool! I like the car valet by Alex. I like the Ladybug Travel Pillow by Li'l Lewis. Thanks. I adore Trixie the Trunki. I think Frieda the trunky is so cute! what a wonderful contest ~ thanks for posting! I really like the Trixie the Trunki, it's just so cute! Thanks for the giveaway! I like the Horses bookbag! i love the Trixie the Trunki. great ideal. I think the Piggy Mermaids Art and Activity Backpack are pretty cool! Little Jet Set is a great site for finding items for children. I really like the neck pillows...especially the dinosaur. They offer several different ones...I ordered two some time ago for one of my granddaughters and grandson. They always wanted to use my neck pillow when my husband would pick them up and bring them to visit us. So I figured they would like to have their own.